Our first permaculture training successfully ended on January 16, 2019. Last week, we shared photos and information about the first five days of training. This week’s article focuses on the remaining four days of the Permaculture Design Certification Training. Bruce Blair (Board Member & Trainer for SLFND) demonstrated the benefits of polyculture with a model. He explained that polyculture is where unrelated plants grow together. He also showed videos of one particular type of polyculture: The Three Sisters. Typically, the Three Sisters include corn (maize), climbing beans, and squash. This practice originated from Native Americans. Bruce Blair (SLFND) sharing short documentaries on polyculture and explaining the process to our students. Bruce discussed group assignments where students create their own design projects. Additionally, he gave our students the option to select a site or social design. What is the difference? Site design focuses on a single garden or farm project, whereas social design includes the whole system design (i.e. economic, environment, health, etc.). Bruce explaining the group design projects using his model as the example. 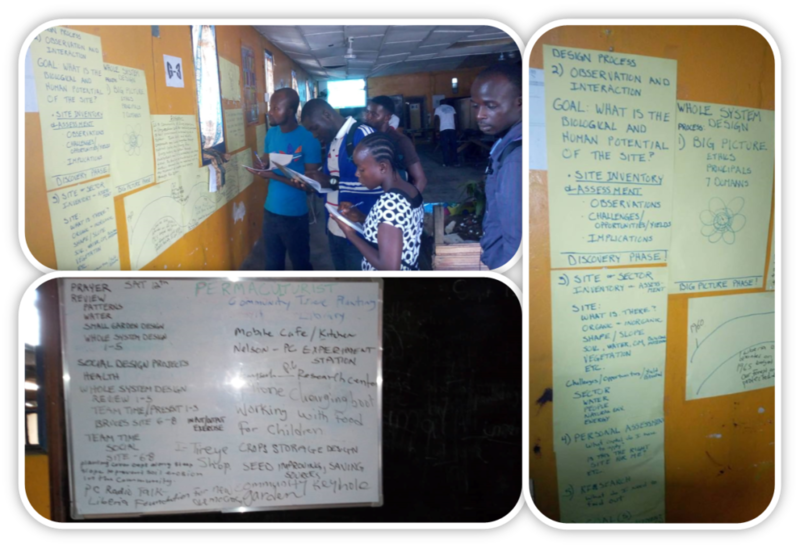 After the assignment discussion, the students reviewed the notes on the board in preparation for their group project. Group presentations started on Monday. UDS students taking notes of their group project assignment. On Monday, the groups took their turn to demonstrate what they learned in this class. Each student of the group needed to share something about their project in order for Bruce to assess their knowledge of the permaculture process. As you see in the photos below, our students used different types of 2-D or 3-D models to explain their group projects. Photos (left to right) show different group presenting their group projects. Some drew their designs on paper while others used a 3-d model. On Tuesday, Bruce took the group over to the field site to discuss the banana cycle. A banana tree can reproduce itself. Instead of a seed, it grows from the bulb (rhizome). Bruce explaining how the banana tree reproduces itself. The group presentations continued into day 9. Clearly, our students put a great deal of effort into their group project designs. As result, they met the course requirements to be certified in Permaculture Design. UDS Co-Founder & Director was part of this group project on social design. Halfway through the day, they paused the group presentations. Joy Alizadeh would soon be leaving, and they wanted to recognize both her and Bruce. So, Kelvin Fomba (UDS Co-Founder & Director) joined Bruce and Joy up front to express the gratitude of all the students. Then he presented them a surprise Thank You Cake made by our catering students. Photos (left to right): 1) Kelvin giving UDS appreciation to Bruce & Joy, 2) Kelvin presenting the Thank You cake to Bruce & Joy, 3) Catering Students icing the cake, & 4) Bruce holding the cake. Soon after Joy left, the group presentations resumed. Once the last one ended, the certification ceremony began. Our long-time friend, Rev. Samuel Enders presented each student with their certificate. He also gave a motivational speech about taking this knowledge and putting it to use immediately. In fact, this course taught our students they can start with the resources of the earth and their own two hands. Rev. 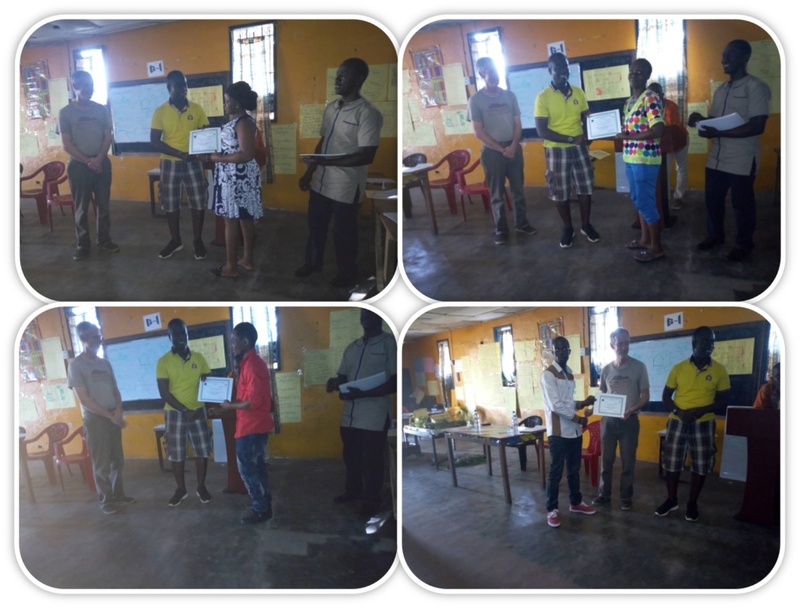 Samual Enders of African Dream Academy (yellow polo) presented the students with their certificates. Bruce is on the left and Kelvin on the right. Next, our students took photos to share their excitement with you. We had 41 out of 45 students successfully complete this course. Unfortunately, the other four had to drop due to scheduling conflicts. UDS students celebrating and proudly displaying their certificates. Finally, I want to Thank all our dedicated students and team for their active participation in this course and taking good care of our guests! Additionally, I want to extend our sincerest Thanks to our four sponsors (Ali, John, Edward, and Joel) and SLFND Team (Hindolo, Bruce, Joy, and Brenda) for their support! This entry was posted in Africa, African Dream Academy, Cake, Catering Course, Hotel Management Course, Liberia, NGO, Permaculture Training, Sierra Leone, Sierra Leone Foundation for New Democracy, Skills training, Trade School, Uniting Distant Stars, vocational training, youth development, Youth Leadership and tagged Africa, African Dream Academy, Liberia, NGO, permaculture, Sierra Leone, Sierra Leone Foundation for New Democracy, Skills Training, trade school, TVET, Uniting Distant Stars, Vocational Training, Youth Development, Youth Empowerment. Bookmark the permalink.